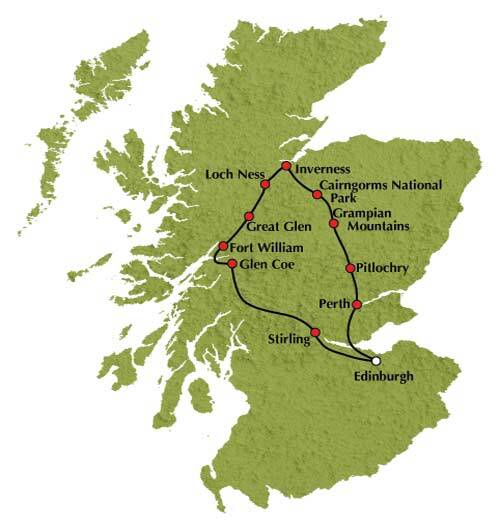 This tour takes you to Pitlochry, Loch Ness, Fort William. A splendid tour through the Scottish Highlands. The captivating allure of Loch Ness is as strong as ever. Make up your own mind about what lives beneath the water's surface on this splendid day in the Scottish Highlands. From Edinburgh: We head over the Forth Road Bridge and through the ancient Kingdom of Fife by way of Loch Leven to Perth. We stop for morning coffee in the delightful Victorian resort of Pitlochry before travelling through Glen Garry to reach the naturally stunning Cairngorm National Park. Tour through Inverness, for Centuries the main community of the Highlands, and then travel along the banks of mysterious Loch Ness. Why not take a cruise* on the deepest waters of the loch to experience stunning views of ancient Urquhart Castle ? Later enjoy the magnificent scenery of the Great Glen as we tour along the banks of its three lochs: Loch Ness, Loch Oich and Loch Lochy. Next is Fort William which sits in the shadow of Ben Nevis, Britain's tallest mountain. We make a stop in Glen Coe, the "Glen of Weeping", to appreciate its atmospheric splendour. In 1692, forty of the resident MacDonald clan were massacred in cold blood by the Campbellsfor not rejecting the Jacobite cause. The windswept wilderness of Rannoch Moor extends for some 50 square miles and is one of the most unspoilt areas in Europe. We descend the Black Mount, with wonderful views of Loch Tulla, before arriving in the small community of Tyndrum. We continue through Glen Ogle to Lochearnside and enter Rob Roy MacGregor country as we return from the Highlands to the Lowlands. It's then only a short drive from Callander to the main route back to Edinburgh. Between the months of November and March this tour may operate in reverse direction. Tour Highlights: Pitlochry, Cairngorm National Park, Spean Bridge, Loch Ness, Fort William, Glen Coe, Rannoch Moor. Child rates apply from 3-15 years inclusive. We regret that children under 3 are not carried on this tour.